Today you will get to know my pencil case. I only bought it recently, beginning of April this year, but it is my favourite pencil case so far. I bought it after having used another pen case from the same company for over a year (pictured in the background) and being extremely satisfied with it. 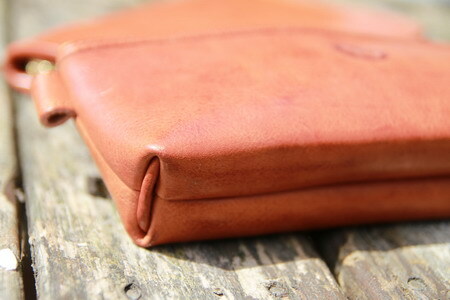 This case, called Berit, is one of many Sonnenleder pencil cases available and is made from cow leather. The leather is tanned using traditional, herbal methods and the cows came from the Allgäu region at the foot of the Alps (I used to go to the Allgäu region in winter). I bought the new pencil case in a small book shop after contacting the manufacturer, Sonnenleder, who gave me the address of this book shop. When I asked about shops that sell their products they also told me that they would ship to me free of shipping costs, because there are no shops near Preston, where I live. I was positively surprised about this because I live in the UK, but they are based in Germany. I assume they will send their products free of charge within Europe, maybe world-wide if there is no shop selling their products nearby, but I have not confirmed this. A very nice case. Os Wayfarer has a similar one I am hoping he will review soon. Classic looks like this will never go out of style. Thank you very much for sharing this item with us! I am certainly not familiar with such crafted pencil cases. If you can indulge a novice, may I ask a few questions. What are the loopholes on the sides used for? Also, the Sonnenleder website shows these items in the “school” section. Are these items truly marketed at children? When you write “not exactly cheap”, I’m wondering if parents are really the main purchasers. And finally, about Manufactum. I’ve been aware of them for years, but really know very little about them. Are the items they sell that don’t have a stated manufacturer or origin, custom made for Manufactum? They seem to have a good number of “no-name”, yet very expensive, items. Anyhow, thank you for the post. It is a great glimpse into an interesting realm of stationery. Atticus: It would be nice to see a review of the other case. I wonder how it looks like. Stephen: I am not sure what the loopholes are used for, but they are common. I have seen them on other cases as well. I also do not think that children are the main customers. In Germany you can get mass produced pencil cases made from leather very cheap, and children tend to write things, like names of pop stars etc., on their pencil cases. It would be a shame if this would happen to this nice pencil case. My other Sonnenleder case is even better. Last year I paid £28 for it ($40). At that time the pencil case presented here would have cost $25. 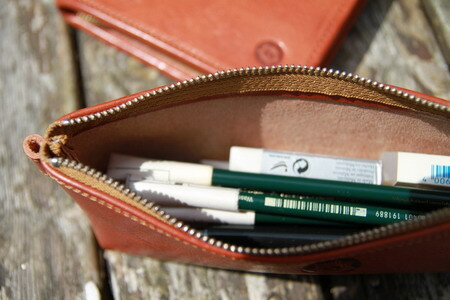 For a hand-made pencil case made from vegetable-tanned leather this is a great price. Unfortunately the currency exchange rates changed a lot in the last year and this case does now cost more than $40. About Manufactum: Some items are custom made, but most are not. They focus on simple, high quality items (some might call it old fashioned). The items are from all over the world. I have seen products from the USA, Germany, Sweden, Italy, China, Japan, etc. I think many of the products are really so expensive, even if you buy it somewhere else, but some of the items can be found cheaper elsewhere. For several reasons I am not too fond of Manufactum, but nevertheless they offer many good quality products in one place. memm, thank you for the follow-up information. excellent review! Thanks. This item radiates quality. As for the loops – As far as I know, they are handles. Makes it easier to open/close the zipper. I tried to order this from Manufactum, but they do not accept payments from the USA, nor via Paypal. (Rather surprising in this day and age!) I wrote to Sonnenleder but received no answer. Schade…I love Sonnenleder products. I have the larger Maeppchen. But this is just such a lovely pouch! Adair, if you don’t shy away from the extra shipping costs I’d be happy to place your order at Manufactum (I’m in Germany) and send you the item(s). I did contact Sonnenleder in the past, but they are often away on trade fairs and will only see the emails and reply to them once they are back (which can take two or three weeks). From one of their emails I did get the impression that they offer free postage abroad, but this must have been a misunderstanding. After asking Steffi (Ms Stefanie Karle) from Sonnenleder about this I was told that they cannot offer free postage to England (and I assume not to the USA either), but my understanding is that they do send overseas. Gunther and Memm: you are both wonderful. Thank you for the offer. I wrote to Sonnenleder one more time. If they answer, I’ll order through them and thus not inconvenience either of you. If they do not, I’ll write back and take you up on your offer, recompensing you of course for all extra shipping. Again, thank you so much! What a nice community of pencil enthusiasts. Gunther, a million thanks. 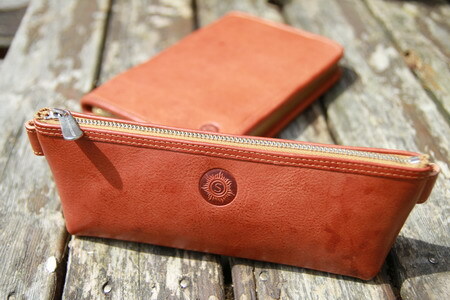 For now, I have opted for the Rhodia pencil case, which I purchased easily from Bureaudirect in the United Kingdom. If you or Memm ever want any pencils from the US, just let me know. Adair, you’re welcome, and thank you for your offer! Which of the two cases is your favourite, having had both for some time? And why? Hi, thanks for this question. I use the pencil case (Berit) for pencils, there are also two or three small sharpeners or erasers in there. 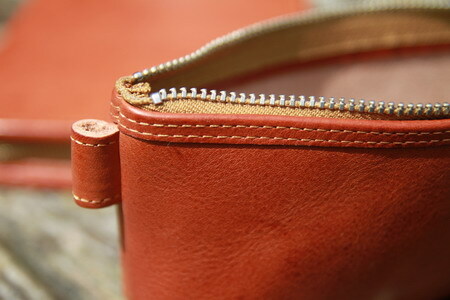 The other writing case (Lasse) is used for fountain pens and mechanical pencils. The reason is that I think these heavier pens would make scratches each others surface in the Berit case, but in the Lasse case the loops keep them at a safe distance. So for me both have their specific purpose and each is my favourite for that specific purpose. Thank you very much for the prompt and illuminating response. I have been thinking of buying either a Berit or a Lenz (a smaller version of the Lasse) for my fountain pens and lead holders. I also want to avoid scratches on my modest, but precious (to me) collection. I am now leaning towards a Lenz for daily use. I hope you’ll like whatever model you decide to buy. One think to mention if you want to use it for fountain pens: I only put them in the loops on one side – it would get quite crowded if you want to fill the loops on both sides. Also: the loops are quite close to each other so unless they are thin fountain pens you might not be able to fill all loops without the pens touching each other. It would be great to hear whether the Lenz is suitable for fountain pens and how many you can store safely.